Since 1954, Kyoto University has been managing a population of fruit flies, living in total darkness. 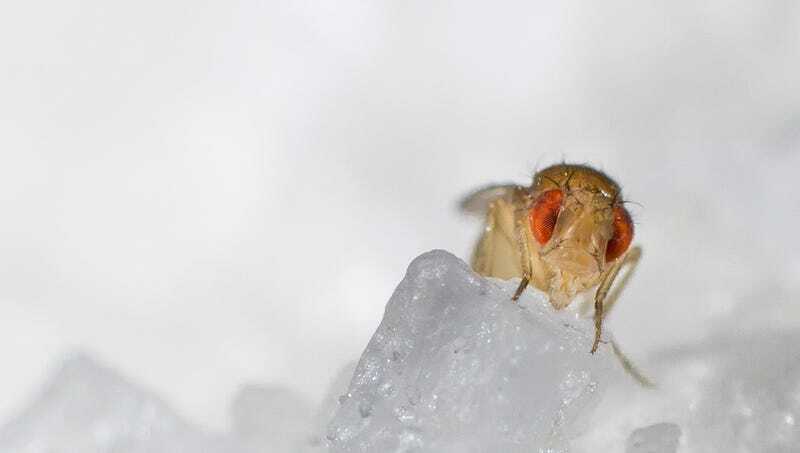 Now, after interbreeding some of these “dark flies” with regular flies, the researchers are learning more about the genetic adaptations taking place when fruit flies are kept entirely in the dark. Superficially, a dark fly does not look very much different from a normal fly. Over 1,500 generations in the dark has left it with slightly longer hairs for sensing the world around it, but most scientists — even those who look at fruit flies all the time — wouldn’t notice much of a difference. So it was up to the Kyoto scientists to find other ways to tell the difference between fruit flies who had been kept in complete darkness for 60 years and those who hadn’t. They came up with an interesting preliminary technique, and just published the results of their studies in the journal Genes Genomes Genetics. They’ve found about 84 genes that, while they make no difference on the outside, distinguish dark flies from other flies. The researchers think that most of them are giving the dark flies enhanced chemical signaling and sensing capacities. In other words, they smell, in both senses of the word. They both emit more pheromones and sense pheromones more easily. It’s also possible that these flies have slightly different rhythms when it comes to producing eggs and sperm, and engaging in mating behavior. Scientists are still studying the fly to see what adaptations darkness brings out in them, what adaptations they lose, and when they lose them. It might tell us something about how certain innate, and difficult to eradicate, human adaptations work. For example, after well over a thousand generations in the dark, the fruit flies still had circadian rhythms, and still responded to (and moved towards) the light.